Around 15 protesters made a performance stunt at the Musée du Louvre on Monday (12 March) to condemn the museum's sponsorship deal with Total, the French oil and gas company. Dressed all in black, the activists laid down in front of Theodore Géricault's oil painting Le Radeau de la méduse (1818–19), which depicts the onset of a shipwreck, in the museum's Denon wing. As choreographed bodies fell to the floor, two voices decried Total's worldwide activities and how they harm the environment and indigenous people. 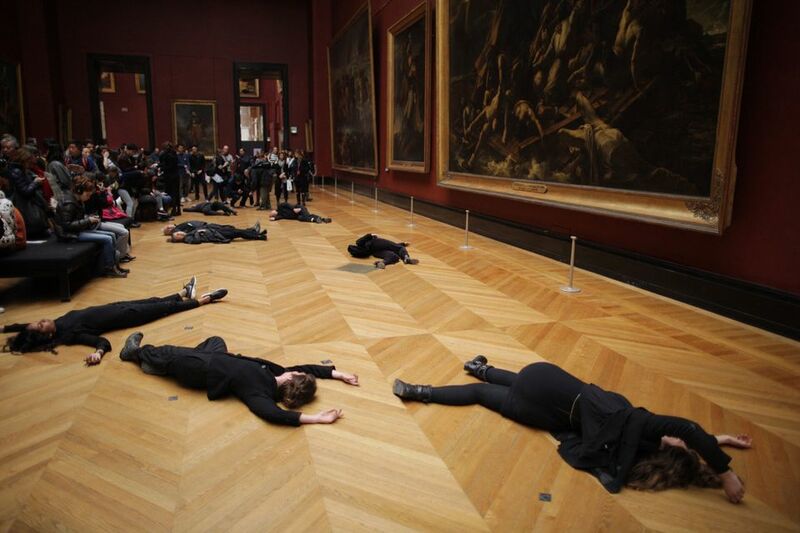 After stunned visitors were quickly evacuated from Salle Mollien, which displays Old Master paintings, the protesters continued lying down for two hours, blocking the gallery. The theatrical performance was organised by the Paris-based collective Libérons le Louvre (Free the Louvre), which was set up with help from 350.org, an international NGO against the fossil fuel industry, which initiated Zéro Fossile, a “fossil free” campaign in France. The collective has launched an online petition calling on the Louvre “to immediately end any partnerships with the fossil fuel industry”. This was Libérons le Louvre's fifth protest at the institution. Last March, the group simulated an oil spill on a staircase underneath the Greek sculpture Victory of Samothrace when around 40 activists took off their black jackets and placed them on the stairs. In May, protesters released a flight of black paper starlings from a balcony in the Louvre and, later that month, the collective held a picnic on the museum's lawns. On European Heritage Day in September, the group poured black liquid into the water basin next to I.M. Pei's pyramid. “Our heritage or the image of Total – the Louvre Museum must choose what it protects,” Libérons le Louvre said in an online video posted on Facebook. The Musée du Louvre declined to comment on the protests and its sponsorship deal with Total.